Everyone knows Saigon is full of great food. But there’s one corner in District 1 where you can eat three excellent meals – breakfast, lunch and dinner – in three excellent establishments, all within a few metres of each other: I call it the Food Triangle. Each ‘point’ of the Food Triangle represents a meal (map). 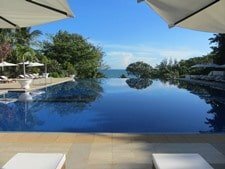 One of these establishments is already spectacularly famous, but the other two, although highly regarded by locals, have yet to make it onto the traveller/expat radar. 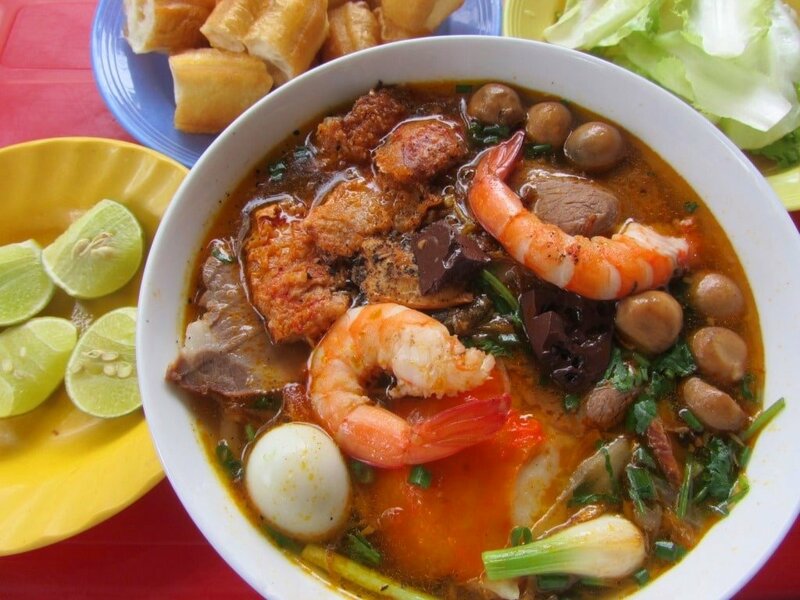 A day of eating your way through the Food Triangle – each meal interspersed with trips to other attractions around the city – is both a great introduction to Vietnamese food, and a great way to spend 24 hours in Saigon. The Food Triangle is located at the northeastern edge of Saigon’s District 1, close to the banks of the newly revitalized Thi Nghe Channel. The area is leafy and quiet for most of the day, but at night, street performers (flame eaters, Michael Jackson impersonators, magicians) liven things up considerably. 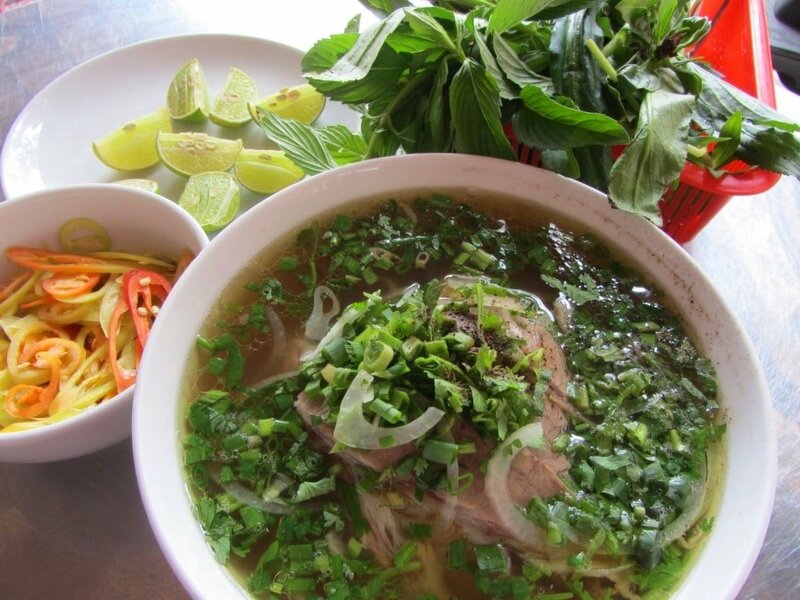 The three meals in the Food Triangle encompass a wide range of classic Vietnamese dishes, and the dining atmosphere at all three establishments is typical and local. For over 30 years, Phở Phượng has been ladling out its cinnamon and star anise-scented broth to loyal locals and the occasional traveller. Phở – probably by now one of the most famous noodle soups in the world – is a national pride and a favourite pastime for many Vietnamese. Take your seat on a red plastic stool in the cool early morning air and let the soupy vapors invigorate you. Tear up those southern herbs (basil, mint, sawtooth coriander, rice paddy leaf), throw in some fresh-cut chillies, add a squeeze of lime, and let your day of eating begin. For much more about Phở Phượng read my full review HERE. A global street food superstar, the Lunch Lady occupies a shady corner of a local neighbourhood, just a 30 second walk up the alleyway from Phở Phượng. 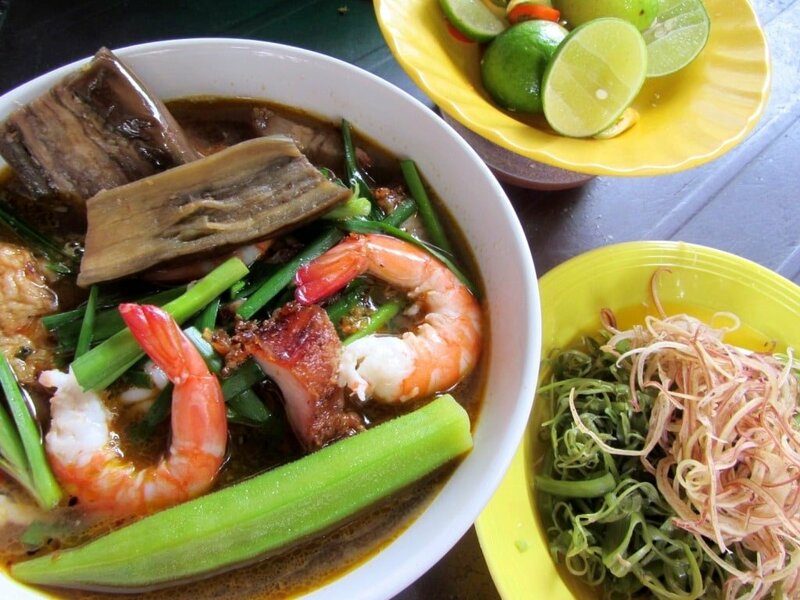 In the shadow of a creaking old apartment block (where, despite her fame, popularity and, presumably, fortune, the Lunch Lady still lives), Ms Nguyen Thi Thanh serves up her famous ‘rotating menu’ of a different soup each day of the week. Despite a certain amount of backlash in recent years (over the quality of her food and overcharging of foreigners, most of which is unfounded), the Lunch Lady remains a solid bet for a big, bright, nutritious bowl of noodles. The soups are wholesome and delicious: packed with chunky bits and pieces, and so colourful and tactile that I would gladly frame one and hang it on my wall. For much more about the Lunch Lady read my full review of her menu HERE. After the sun has melted away on Saigon’s hazy horizon, fluorescent strip light bulbs flicker on at eateries lining the banks of the Thi Nghe Channel: it’s dinner time. Quán 25 occupies the corner opposite Phở Phượng, with outside seating sprawling along the alleyway, continuing all the way up to the Lunch Lady. Grab a table, order a few local beers, and delve into the encyclopedic menu. If you can’t read Vietnamese, you can still rely on the silhouettes of animals to guide your way through the dishes. Quán 25 specializes in bê thui, or thịt bê (veal). 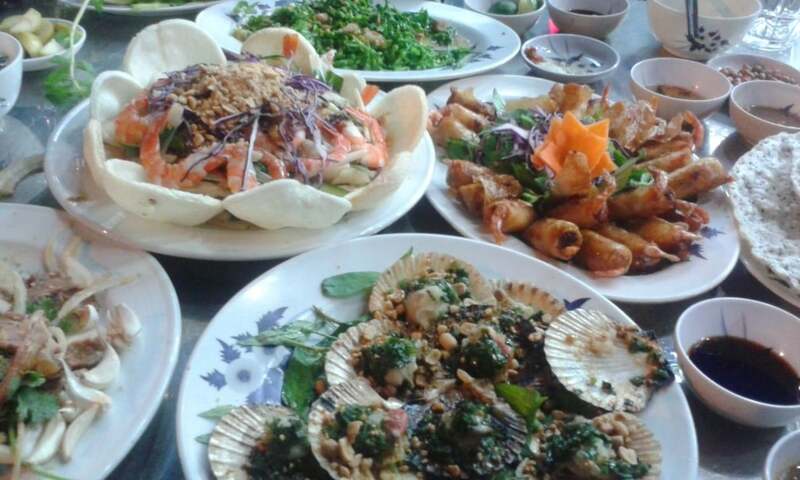 However, they also do a refreshing gỏi ngó sên tôm thịt (a spicy lotus stalk, shrimp and pork salad with prawn crackers), gigantic ốc bươu nướng tiêu tía tô (grilled fresh water snails with perilla leaf and black peppercorns), crunchy bông bí nhồi thịt tẩm bột (deep fried pumpkin blossoms stuffed with pork) and, for the adventurous, chim sẽ nướng mọi (grilled baby sparrows dipped in lime, pepper and salt). The food is fabulous, and the dining ambience – lively, loud, humid, busy and animated – is what eating out in Saigon is all about. 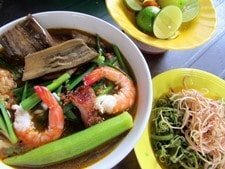 This entry was posted in ALL, FOOD & DRINK, Meat, Noodles, Resources, Rice, Seafood, Soups, Street Food, Uncategorized and tagged blog, food, guide, Ho Chi Minh City, lunch lady, pho, Saigon, Vietnam, where to eat. Bookmark the permalink. Hi Tom, this food triangle looks great! I’ve been to the Lunch Lady a few times and loved it. And now, I definitely want to try this pho from next door. Any cafes in the area that you recommend that I can hang out in between breakfast and lunch? You can try Up Cafe – it’s just up the road on the corner of Hoang Sa and Nguyen Van Thu streets, before you go under the Dien Bien Phu bridge. They have good coffee, indoor seating, but there’s a couple of seats outside too, or you can get your coffee to go and sit on a bench next to the Thi Nghe Channel. 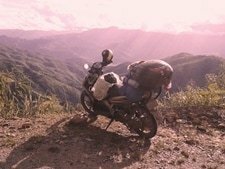 I stumbled across your site while researching information on motorbiking through Vietnam. My husband and I will be taking our “honeymoon” there this October. I’m now drooling just looking at these pictures of wonderful food. To say I can hardly wait 6 months for this trip is an understatement! Great post and fantastic website! 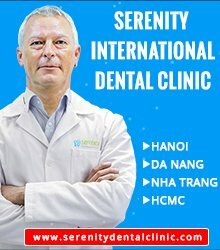 My wife and I are making our first visit to Vietnam this coming March. We will be sure to check these places out. 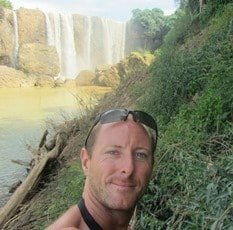 Your entire site is very inspirational! I’ve read that travelers should be somewhat wary of the food they eat as their systems aren’t accustomed to the region. Especially raw fruits and veggies. Do you think this applies to the “fixings” that come with a bowl of phở – I can’t picture a bowl of phở with out loading it up with peppers, etc. Any advice there or with eating in general? Thanks for all the info you provide! To some extent that’s true, but the vast majority of times, eating on the street in Vietnam will not result in stomach trouble. It’s a great shame that so many travellers avoid this kind of food for fear of getting sick: eating out in Vietnam is quite possibly THE best thing anyone can do when visiting the country. Certainly I would not expect the food (and the ‘fixings’) in the Food Triangle to lead to a bad tummy. 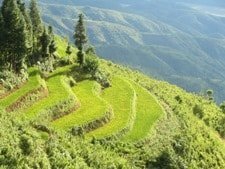 The Food Triangle is a great place to start your culinary adventure in Vietnam, because all the places are busy (a prerequisite for good local diners) and there’s a good range on offer. Really, my advice is: go for it! (If you want more excellent advice and background on street eating in Vietnam, I recommend the recently published Eating Việt Nam by Graham Holliday). Thanks for the reply. Excited for the trip and all the delicious food (especially looking forward to Ăn ốc). I’ll be sure to “trust the vietnamese palate” as you say. Keep up the great work!